The primary goal of these sandals is to prevent complications, which can include strain, ulcers, numbness calluses, for patients with diabetes. People with diabetic neuropathy in their feet may have a false sense of security as to how much at risk their feet actually are. Our sandals have been designed taking in to the above all considerations, makes you comfortable. It is very light in weight, that you do not feel any pressure under their feet. The inner portion is so soft with MCP / MCR layer,that the feet and heels rest comfortably with proper support . Properly padded wherever the skin is in contact with sandals. These footwear provide plenty of room for toes as well allow air to circulate freely. DIS Footwear has no heels or pointed toes thus reduce the pressure on the foot. Available sizes starting from 6 to 11. Product Details : Uppers : Premium 100% Genuine Leather , with adjustable reverse straps Outer Sole : High Quality PU Sole Innersole : High Quality MCP/MCR sole to give feet & sole the needed comfort & the stability Colours : Brown & Black Why Special Footwear? 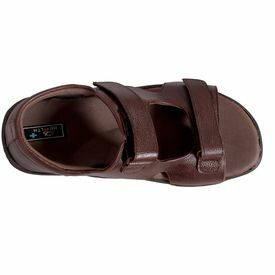 The primary goal of these sandals is to prevent complications, which can include strain, ulcers, numbness calluses, for patients with diabetes. People with diabetic neuropathy in their feet may have a false sense of security as to how much at risk their feet actually are. Foot ulcers are common complication of the diabetic foot. Ulcers are caused by too much pressure on an area and the skin just "breaks down". They can occur under Corns and callus. Healing can take a while and it is imperative that pressure is removed from the area and good wound dressings are used DIS Sandals and custom-molded inserts work together as a preventative system to help diabetics avoid foot injuries and improve mobility and reduce the chance of damage happening, Our sandals have been designed taking in to the above all considerations, makes you comfortable. It is very light in weight, that you do not feel any pressure under their feet. The inner portion is so soft with MCP / MCR layer,that the feet and heels rest comfortably with proper support . Properly padded wherever the skin is in contact with sandals. These footwear provide plenty of room for toes as well allow air to circulate freely. DIS Footwear has no heels or pointed toes thus reduce the pressure on the foot. Available sizes starting from 6 to 11.